Faint filaments in Saturn's atmosphere spiral around two oval-shaped storms in a direction opposite to the winds which rotate around Southern Hemisphere hurricanes on Earth. One storm is seen near the lower right, and the other is near the lower left above a much darker storm. Atmospheric scientists do not yet fully understand what these filaments are, but some possible explanations have been proposed. The filaments might represent material connecting the spots if the two have recently split from a single storm. The spirals could also represent wind flow in the atmosphere. Further investigation by Cassini imaging scientists is likely to clarify the precise nature of the filaments. 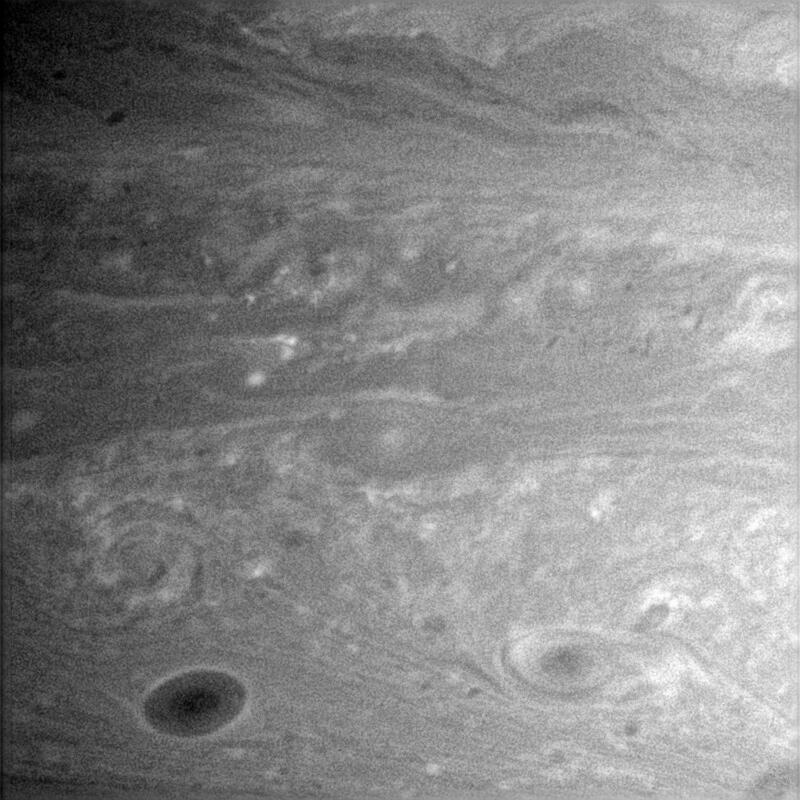 The image was taken in visible light with the Cassini spacecraft narrow-angle camera on July 6, 2005, at a distance of approximately 2.4 million kilometers (1.5 million miles) from Saturn using a filter sensitive to wavelengths of infrared light centered at 750 nanometers. The image scale is 14 kilometers (9 miles) per pixel.